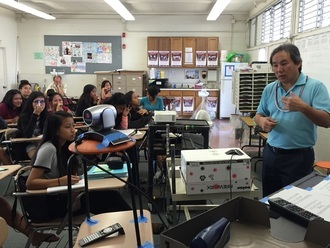 Dr. Scott K. Kuwada, a graduate from University of Hawai'i at Manoa and a professor at John A. Burns School of Medicine, talked about his journey in health care and provided reasons why students should also consider a career in the health field. Discussing the variety of jobs offered in the health field, such as doctor, nursing, gastroenterology and many more, he explained how each career intertwine with each other to provide health care for every individuals in the country. Also, he gave advice to the students on what they should do and the path they would have to take in order to achieve their goals. A medical director with HMSA Department of Medicare Programs, Dr. Rae Seitz, is a founding member of the Kokua Mau, Hawai'i's palliative and hospice care organizations. Palliative care is an interdisciplinary medical service that aim to relieve suffering and improve quality of life for patients with chronic and advance illness and their families. A team of specialist come together in order to provide the best care for their patients. Paramedic Danny Kao, informed the students about mass casualty incident on November 14, 2013. A mass casualty is when an event exceeds the capabilities of health care workers. Paramedics and rescuers are expected to work quickly because 70-80% of fatalities happen in the first twenty minutes. Students were informed about labeling patients with tags— black, red, yellow or green, as well as locating and moving people from the hot zone, the site of destruction, to the cold zone, where the ambulances and medical help are located. Students also learned that it’s very important to not become emotionally attached to their patients because it can affect their performance. On November 21, 2013, nuclear medicine specialist, Dr. Michael Ling, spoke to students about how he got into the field of nuclear medicine. Nuclear medicine is a specialty that involves the use of radioactive substances in the diagnosis and treatment of diseases. In order to see the abnormalities, radiopharmaceuticals are taken internally, either by mixing it in food or injecting it into a specific target organ or area in the body, and then examined. Dr. Ling told the students that after his father became sick, he decided that he wanted to become involved in the medical field to make a difference in the lives of other people. He informed the students about a field of medicine that they have never thought of before. On December 2016, Allan Nebrija, a College Recruiter for Leeward Community College informed students about the different college degree options available and the transition from high school to college. The degrees that Mr. Nebrija talked about are Associate, Bachelor, Master and Doctorate degrees, also mentioning the average annual income related to each degree, which ranges from $41,469 to $84,396 and unemployment rate ranging from 3.8% to 1.7%. The higher the education level obtained, the higher the average annual income and lower unemployment rate, showing how the further education an individual obtains, more opportunities are available for them. He also touched upon the differences between high school and college and the challenges students face after high school -- emphasizing the importance being responsible and independent student. Lori Protzman, currently employed with Queens's Clinically Integrated Physicians Network, which provide advance care planning consultation for patients/families in the medical center, ambulatory environments as well as educating staff, physicians and the community on advance care planning. Advance care planning gives you the opportunity to address your wishes and preferences about the care you want to receive when you become very ill. Some of the ways to document wishes include Advance Health Care Directive, Living Will, Trust and conversation with primary doctors. It is important to have an advance care plan because it provides families a "peace of mind," ease the burden for others having to make tough choices and helps assure wishes to be followed. ​On November 2, 2017, Jan Hafner presented to students about the Problem of Marine Debris. Hafner is part of the International Pacific Research Center at the University of Hawaii at Manoa. He works alongside his team members Nikolai Maximenko and Gisela Speidel. There are about 8-12 million tons of debris in the oceans annually. Many of the debris comes from the land and is washed into the ocean through rivers. A large fraction of the debris is mainly from Southeast Asia. Debris that has fallen into the ocean end up is ocean gyres which are also known as garbage patches. The North Pacific Ocean Gyre has the most marine debris. Marine debris can harm various marine life such as sea turtles and birds as they get stuck in or consume the debris. The debris can transport animals and may introduce invasive species. The debris also poses a potential hazard for navigation. Of the Hawaiian Islands, Ni’ihau has one of the highest densities of marine debris along its beaches. 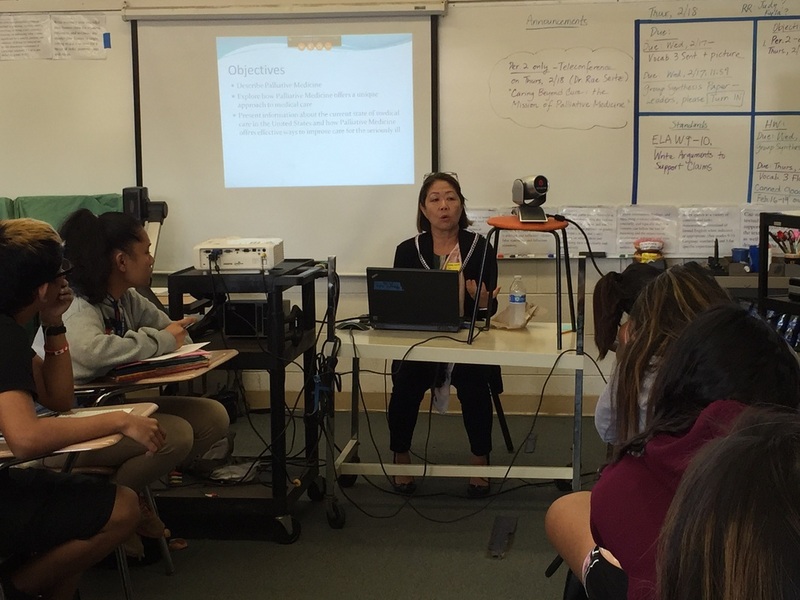 ​On November 30, 2017, Nancy Partika spoke to students about Oral Health for All Hawaii. Partika is a Registered Nurse and a Public Health Educator. She has worked on various projects and Oral Health for All Hawaii is her most recent project. Oral health includes not only teeth, but also the gums, tongue, and mouth. Oral health is interconnected with the rest of the body meaning it can affect one’s overall health. Within oral health there are disparities, or inequalities with poverty being the most important factor. Many states have fluoride in their water. Fluoride can help to strengthen teeth. Hawaii is one of the states that has a public water system that does not contain fluoride. Many feel that we need to keep Hawaii’s water pure. Oral health in Hawaii is a problem. There are many dentists who do not accept Medicare or Quest. A lot of people have to commute interisland in order to receive dental care. Oral health is also not a priority when there are other socioeconomic and health problems to think about. To improve oral health, social justice practices and equity needs to be used in which services are provided based on need and on what is right.